I’m typing this while standing up. My feet hurt. My back hurts. There’s a pain in my left leg just above the knee, and a tingle in the nerves of my right thigh. Obviously, I have things to learn about standing desks. I decided to get a standing desk a month ago. That was about a year after my body decided it had fulfilled its evolutionary duties and could now coast downhill to retirement. My weight went up, my blood pressure went up, my aches and pains went up. This, despite the fact that I eat healthy, have no more than one or two bottles of wine at dinner, walk half a mile to class/meetings five times a week, and average an hour and a half per school day on my feet, lecturing. When the weather is good, most of the Summer and parts of the Fall and Spring, but none of the Winter, here in the NENW, I put in an additional two miles per day in walking. Doesn’t help. Or, no longer helps. I don’t mind the thought of me retiring, but I’d prefer that my body didn’t retire first. Considering that I spend probably ten hours per day at the computer — in a little one-Starbucks/high-scabland town like Cheney, there’s not much else to do — anything I can do to increase my activity level there should be worthwhile. Yes, I’ve got a treadmill, The Imperial Walker, and yes, I’ve tried working on a laptop while walking, but it just didn’t work out. For one thing, I had trouble figuring out where my lap was. 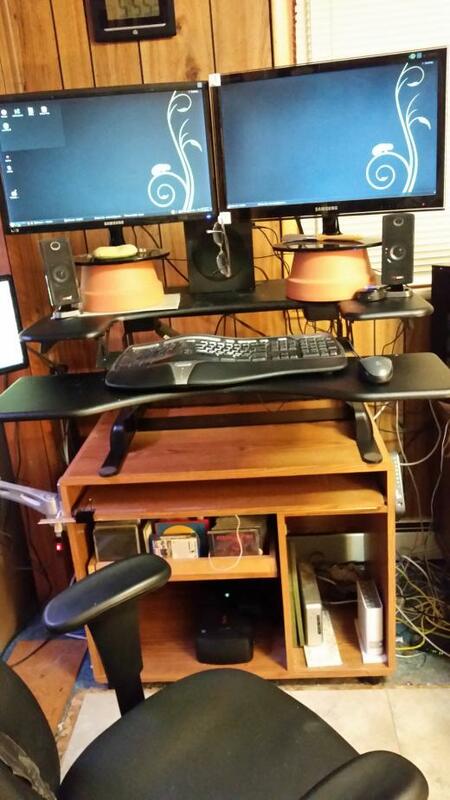 Enter the standing desk. Reportedly, they give most of the benefits of a walking desk, while being much cheaper and more compact. Of course, cheap is relative. Amazon carries a motor operated, dual-surface, multi-monitor, medical workstation for $12,000, and a crank-adjustable work desk for $4500. 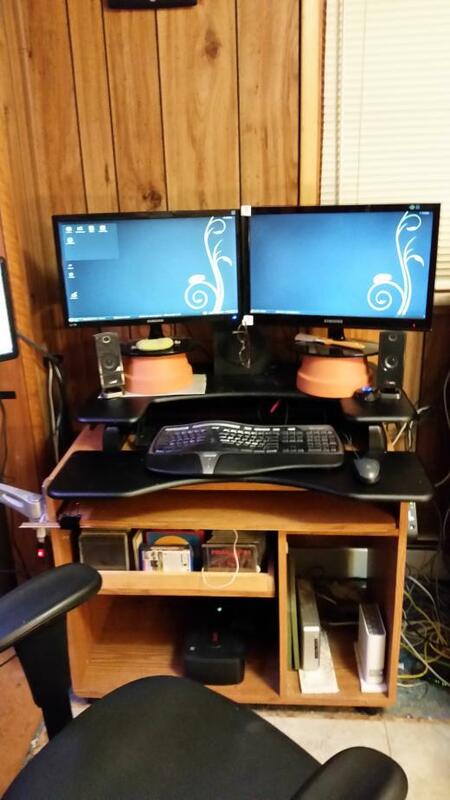 I wasn’t that unhealthy, so I settled for a $350 VariDesk Pro Plus: a spring-operated, desk-mounted rig that was wide enough to take my two monitors. Ordered it last month, got it last week, put it up last night. Here’s my original setup. Two monitors on a twenty-year old rollabout computer desk. Keyboard almost in my lap. Room at the top for my books and speakers. Room at the bottom for my UPS and NAS. 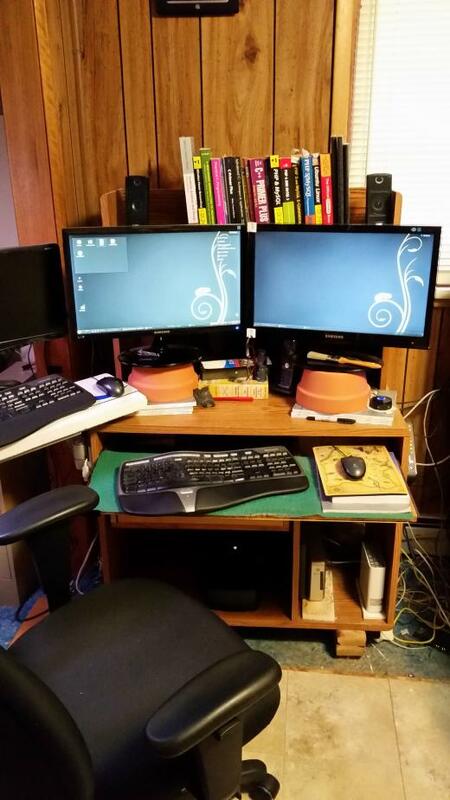 The screen and keyboard to the left are for my Windows machine, which I bought to run school software on but otherwise keep in the closet. We won’t speak of it again. Adding the standup feature was simple. Crawl inside the existing desk and unscrew the screws that hold the bookshelf on. Then get a knife and cut the cardboard backing on the bookshelf, that was nailed to both the bookshelf and the main desk. Pull the boards out from under the desk to lower it a couple of inches. Move the monitors and their pottery pedestals out of the way. And dust. And dust again. All ready for the VariDesk. It’s an impressive beast. Fifty-two pounds. Thirty-six inches wide. Twenty-six inches deep, sort of. It covered my whole desktop, and two inches of the legs hung off the front of the desk. Another six inches of the desk hung off the front of the desk. When at its lowest position, it is only a little higher than my old setup. I still had to use the two clay pots (but not the six back issues of Neural Networks) to get the monitors to the right height. The keyboard shelf is locked to the monitor shelf, so I couldn’t just lift the monitor shelf. No place for my books, and the speakers are now down on the main level. As currently configured, I’m eight or twelve inches further away from the monitors than I was before. That’s because I slid the rig back so that the front legs were totally on the desk and it was the back that was hanging over. I may have to rethink that. Raising the working area is as simple as squeezing the locking levers on each side of the VariDesk and letting the spring help you pull it into position. Since there’s probably twenty pounds of gear on the monitor shelf (rated limit is thirty-five pounds), you do have to use some muscle to get it up to where you want it. Getting it down is equally easy. Squeeze the two levers again, and put some weight into the pushdown. At full extension, with the pots, it is a perfect height for my 6-foot frame. Not obvious from the photos is the fact that in addition to pulling up, it also pulls out. Way out. The keyboard ends up a good eighteen inches farther forward than it was in the sitting position, and I have to move the chair well back in order to be able to stand without suddenly sitting. What’s it like to use? Well, I’m finding I need to pace myself on this whole stand for hours thing. And I will have to start wearing shoes around the house — something with more arch support than tengu getas. While it feels solid, it does shake a bit when I’m pounding away on the keyboard. That’s to be expected, when working out on one end of a big cantilevered rig with movable joints. I haven’t worked with it enough (less than 900 words so far) to tell if that will be a problem. Other issues, yet to be addressed, are how much the new configuration will interfere with use of the computer we agreed not to talk about, the limited clear desk space (it looks like there’s a lot, but when the desktop is stowed, most of it is crushed) the need to rig some sort of static discharge plate (my old one is not easily reachable), the tendency for stuff near the edges to drop off, and the fact that the stylish matte black finish shows every bit of dust, dog hair, flaked winter skin, and dropped breadcrumb. Also, balance and tipping. I’ll write more on these anon. This entry was posted on March 1, 2015 at Sun, 01 Mar 2015 08:22:32 -0700 and is filed under Computing. You can follow any responses to this entry through the RSS 2.0 feed. You can leave a response, or trackback from your own site. I can’t seem to post comments without logging into a wp account I no longer remember, so email it is. I’ll take a look at your solution for my surface. Debby just needs a spot to drop her laptop, worth the rest for sewing, craftwork (but not Kraftwerk), and similar projects. I’ll post photos when I finish and figure out the height solution. (Which remonds me to post a bit on our inexpensive solutions for a minor kitchen redo with new counters and repurposing of big chrome shelving) and my front porch and yard evolution which involved team math (with the younger kids) and some trial and error (still in progress). This is good for a desk, poor for a workdesk. There’s lots of room, but it’s oddly shaped. For the desk function, it’s best if you have something deep enough to hold the full length of the legs. That’s about 24″, and a door should work well. When I was first in grad school, and LBJ was President, we found that cinderblock made good legs.